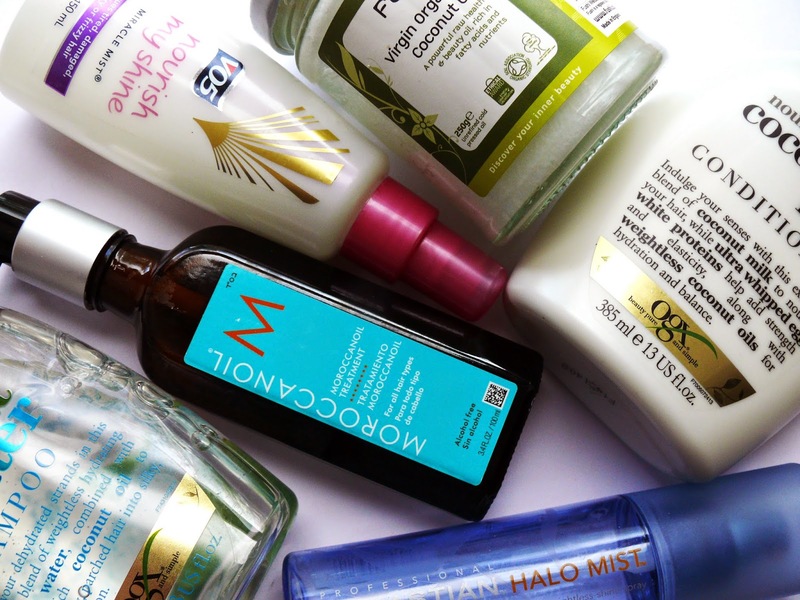 Today I thought I would tell you all about my current favourite hair care products as I haven't made a post about hair care before and I am currently loving a certain six products. I was quite a reckless 14 year old and died my hair from red to black to brown to blonde to white then back to blonde. I had been bleaching my roots a few times a year for almost 4 years up until this year when I decided to grow my roots out and get them highlighted rather than completely bleached. I have always put a lot of effort into caring for my hair to make sure it didn't end up frazzled and therefore cut really sort due to the bleaching and I am so happy that my efforts pay off as my hair is in good condition and is quite long and thick considering how light it is. So for those of you thinking about going blonde it can be done with minimal damage, it just needs to be done gradually and with a lot of hair care! The time I spend looking after my hair has led to me trying SO many hair products so the ones that I use are always changing as I am always looking for something better but above are my current favourites. I'll start with shampoo as I barely buy the same shampoo twice in a row and so far this one has been one of my all time favourites. 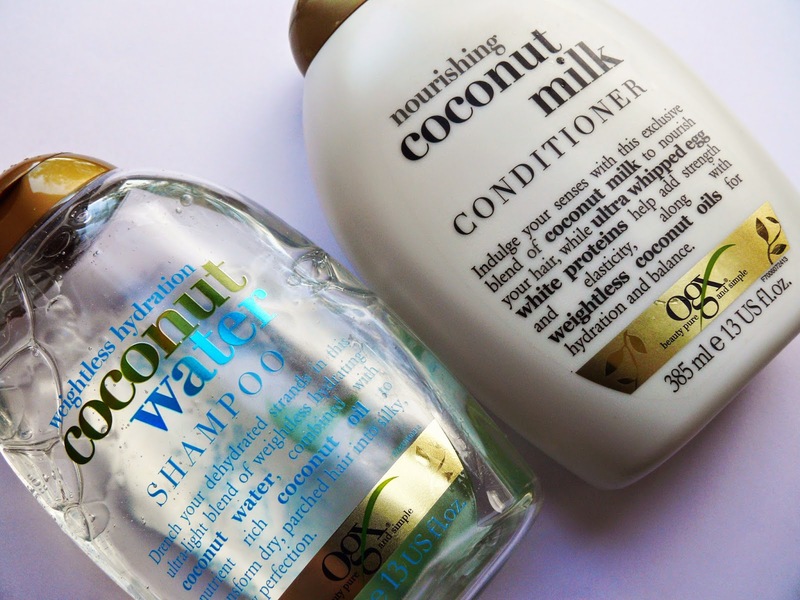 There is a whole range of these shampoos and conditioners in Boots at the moment and I really want to try more from the range as these two have been amazing. They have coconut oil in them and are silicone free yet manage to leave my hair weightless and grease free! They are quite pricey at £6.99 per bottle but they last a lot longer than they seem like they will so I definitely recommend these. I know that many people who are lightening their hair will be considering using silver shampoo, please don't use it! I talk from experience when I say that it dries out your hair and makes it extremely brittle. It has toner in it so using it daily is a lot more damaging than just keeping an actual toner on your hair for 20 minutes then deeply conditioning. I really recommend using less harsh shampoos and conditioners as washing your hair alone makes it drier. This next product is the one hair care product that I have been re-buying for years. 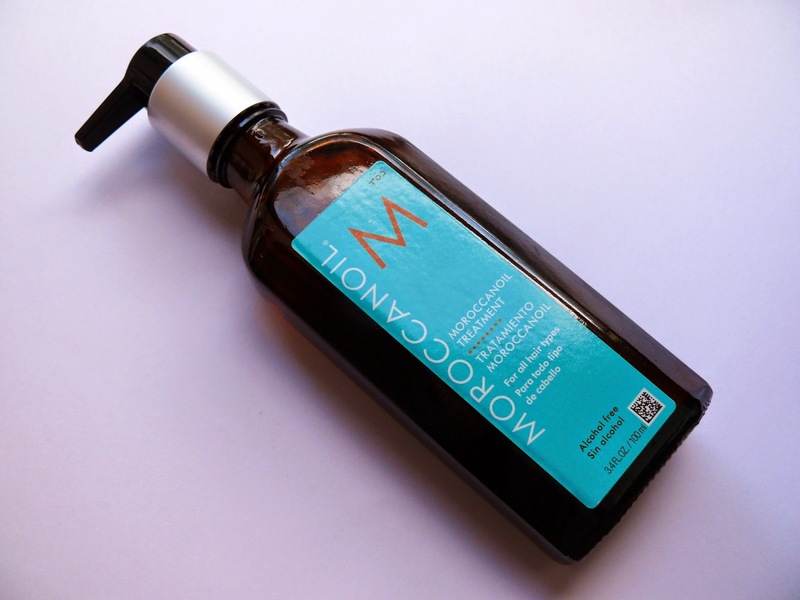 It is this pure Moroccan oil. There are literally hundreds of versions of this product on the market however almost all of them have so many unnecessary chemicals added to them to dilute the oil. There are also so many fakes on the market that have been diluted or perfumed to smell like the real thing. This is the pure natural oil from Israel and I will add a link to where I buy mine. The natural unprocessed oil will have a really strong scent and will be very thick and greasy almost like olive oil. Only a tiny amount is needed on the ends of your hair to stop them breaking and to make your hair super soft. You can also use a lot more and put it all over your hair and roots and leave it on overnight for a an amazing natural hair treatment. It also smells so good. 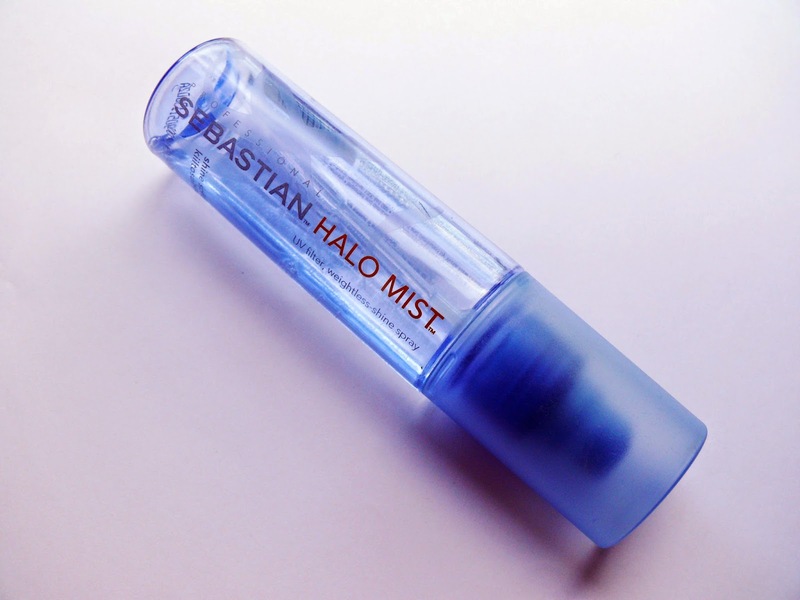 Next on my list just now is the Professional Sebastian Halo Mist Weightless Shine Spray. I love this product in summer because it gives UV protection which stops the tone of my blonde hair from being lost due to the sun. It also makes hair super shiny and soft and is great for applying nearer your roots as well as unlike the oil it does not add grease. Literally only two sprays of this is more than enough so this product really does last for months and months! This retails at around £15 depending where you buy it from but I had first discovered it at a hair salon I used to visit and loved it. Next I am currently using Nourish my shine by VO5. This is just a simple leave in conditioner that is packed full of oils and makes hair so much easier to brush out after washing. At around £4 per bottle I think it's a great buy and would definitely recommend it for all hair types as brushing out tuggy wet hair can cause a lot of breakage for anyone so just adding a few sprays of this stuff will help to prevent that. 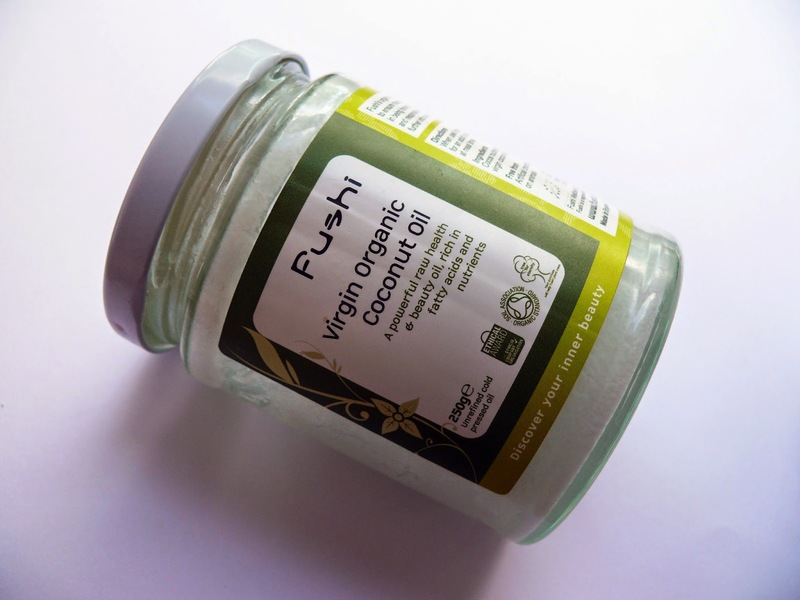 My final favourite product is great for hair and skin and it is basically just organic coconut oil. This is so thick its basically crushed up coconut. I love to put this all over my hair for overnight treatments as often as I can. I also put it on my hair and skin at the same time as it smells delicious and is super moisturinsing. It takes a bit longer to wash out so I avoid using it when I know I'm going to be in a rush the next morning. Let me know what your favourite hair products are and leave me any links to your hair care posts as I would love to read them all! I need to get on the coconut oil hype!